14K Gold 6.0-6.5mm White Akoya Cultured Pearl Necklace, Bracelet & Earrings Set, 18" - AAA Quality | What Should I Say? 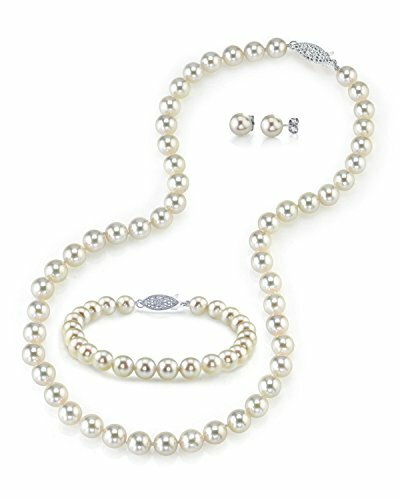 This pearl jewelry set includes a beautiful 6.0-6.5mm Japanese Akoya Cultured pearl necklace, pearl bracelet, and pearl stud earrings. All 3 pieces match perfectly to make a beautiful set. This pearl set is compiled of AAA Quality hand-picked pearls with very clean surfaces and very high levels of luster. The pearl necklace is white in color and comes affixed with a beautiful 14K gold clasp, and you have the option of either white gold or yellow gold clasps to choose from. The necklace is 18 inches in length and the bracelet is 7.5 inches in length. Both pieces can easily be adjusted in length by bringing them to any local jewelry store. Additionally, all products are accompanied with a genuine cultured pearl guarantee, verifying the quality and source of the pearls. All products are packaged and shipped in a beautiful jewelry gift box, creating an elegant presesntation. Sterling Silver Turquoise Oval Bamboo Framed Earrings and Pendant Necklace Jewelry Set, 18"